The Many Purposes of Taking Core Samples in Roofing | Destructive Test | Roof Layers | Benchmark Inc.
One of the first things most roofing professionals learn is how to take a core sample or core cut. Core sampling is a destructive test that involves the cutting and removal of roofing layers until a structural deck is reached. There are many reasons for taking core samples, most revolve around identifying the roofing materials present within a particular roof assembly. The information gathered about the roof system can then be used for estimating, diagnostic, and/or design purposes. As there are different purposes for taking core samples, which we will discuss shortly, there are different methods for cutting cores. One method of taking a core sample is with a special tool developed by the Cold Regions Research Engineering Laboratory, called a CRREL cutter. This tool consists of a 12” long, 2” diameter pipe. One end has saw teeth cut into the pipe, the other has a place to insert a steel rod. The CRREL cutter saws a 2” diameter hole in the roof. The “core” can be pushed out of the pipe and its components examined. The CRREL cutter is fairly efficient, cuts a nice, neat hole (that is easy to patch), and the time involved in cutting is fairly short. The negatives to this method of cutting are that sometimes the 2” diameter hole is not large enough to allow for specific observations and the CRREL cutter tends to compress the insulation (particularly plastic foam) layers. It is also limited to a depth of about 8”, which is normally sufficient, but can leave you short on roofs with deep tapered insulation systems, for example. Other methods of core sampling include cutting with an ax, knife and/or insulation saw, or with a reciprocating saw. Cutting with an ax is quick, but often causes damage to the roof layers being evaluated resulting in conditions or construction data being mashed and not as useful. Cutting with a sharp knife provides the inspector with an opportunity to examine the top layer of roofing membrane, but cut depth is limited. Using a knife to cut through the roof membrane, and then an insulation knife or saw to cut through the subsequent layers, allows for better examination of the roofing layers. Cutting with a knife/saw combination is useful for cutting samples of 4” to 12” square. Larger samples can be done, but takes a considerable amount of time. Cutting with a reciprocating saw makes short work of core sampling and does so with minimal disturbance of the various roof layers. It also is the best method if larger samples are desired. Whether one is taking core samples for the purpose of evaluation or design, one of the primary purposes is material identification. The inspector observes and documents the composition of the roof membrane, cover board, insulation, vapor/air retarder, thermal barrier and roof deck layers, thicknesses, and method of attachment for each layer. With multi-ply bitumen roof systems, the type of bitumen and number of plies can often be determined through core sampling. With single-ply membranes, particularly thermoplastic, the color or markings on the underside of the roof membrane can sometimes provide approximate age of the roof membrane. The method attachments of the various membrane and insulation layers can be useful knowledge to have when devising repair and replacement recommendations. For example, whether the existing insulation can be salvaged and re-used during reroofing may depend on how each layer is attached. Core sampling provides valuable information to assist in estimating the cost of a roof replacement. Knowing the roof thickness helps determine the volume of demolition materials; and therefore, estimates the number of trash containers required. Knowing how a roof assembly is attached helps estimate how much effort removal will entail. Demolition labor and refuse hauling costs can total 25 percent of a reroofing project budget. 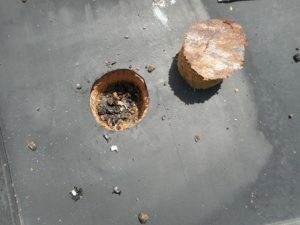 Core sampling revealed an improper type of insulation facer for this adhered EPDM application. The slope or pitch in any roof can be the result of several different methods. Generally in newer buildings, the roof structure is sloped to drains or scuppers, which are placed at low points in the structural deck. Poured-in-place deck materials, such as lightweight insulating concrete, are sometimes used to provide slope on a flat structural deck. Finally, tapered insulation may have been used to create slope on top of a flat structural deck. Particularly with reroofing design, it is imperative to understand what element provides slope, structure, topping layer or tapered insulation. Core samples can be used to identify what element is providing slope. If the roof deck is sloped, then multiple core samples taken at various locations across the roof should show the same roof composition and thickness. If lightweight concrete provides slope, then core sampling would allow identifying the thickness at ridges and drains, helping the inspector to understand how the slope is provided. Similarly, core samples can help define tapered insulation layouts, and minimum/maximum thicknesses, for later use. Core sampling is a very useful tool to help diagnose whether or why a particular roof defect may exist, such as blistering in a multi-ply asphalt roof, loss of roof adhesion (blow-off), hail damage, or suspected wet insulation. Core sampling is the surest method of verifying presence and location of wet roofing components when conducted at the conclusion of an infrared or nuclear moisture detection scan. Core sampling is also prescribed to identify why a roof failed in a field uplift test, such as those required by FM Global in hurricane prone zones (FM Loss Prevention Data Sheet 1-52). Core sampling is required when conducting testing for asbestos content in roofing materials. Testing is often conducted on all roofing layers including roof membrane, insulation and various barrier layers. Identifying the existence of phenolic foam insulation during core sampling is very important information as this material can cause greatly accelerated corrosion on ferrous materials, such as steel roof decking. Once phenolic insulation is identified as being present, larger cores may be taken to examine whether such corrosion is observed. Corrosion of the Type A steel decking was discovered at this core sample. It is quite infrequent that roofs are constructed exactly as originally shown in architectural drawings, even “as-built” drawings. In addition, changes occur between the original building construction and the present. Roofs are often recovered or replaced multiple times during the service life of a building, so original building drawings may not reflect those “updates.” An important example that comes to mind is when core samples reveal 5/8” gypsum board layer placed directly over a steel deck. This “find” is a clue that the existing roof was designed to meet a specific fire resistance rating. Fire resistive ratings are often required over places of public assembly, and fire resistive roof constructions provide occupants sufficient time to escape in a fire. Reroofing design should seek to match the fire resistance rating, an effort that may take some research. Core sampling adjacent to perimeter edge conditions can provide a roof designer with helpful information such as the height, orientation, and condition of perimeter wood blocking. A roof designer can then decide whether the blocking can be re-used or whether it needs to be removed and replaced. Knowing whether parapet walls were sheathed with plywood or gypsum board is also good information, as existing gypsum board is often damaged during roof tear-off and may need to be replaced, whereas plywood is typically re-usable. A good roof consultant needs to have a broad level of experience and knowledge for sure, and it helps to have some wisdom. But I think the difference maker is curiosity. A roof consultant doing roof evaluations or gathering information for reroofing design will be well served to be curious. I have cored through roofs with multiple distinct roof systems only to find thick layers of sloped fill material, frozen insulation, or hidden electrical conduit – any of which could have tripped me up and created certain heartache once under construction. Having a curious mind and the energy to take more core samples will make life easier for the roof consultant, roofing contractor, and owner alike. When a roof consultant or contractor shows the initiative to take core samples, they are exercising due care and diligence, and perhaps – curiosity.